2013: A Year For Living Dangerously? Yesterday I thought about how I can make ISK in Eve while playing Guild Wars 2. Today I'll go to the other extreme and think about actually shooting ships piloted by other players. I started thinking about that when reading Andski's article on TheMittani.com, "The Perpetually Unprepared". I don't think I totally fit Andski's stereotype as I do fly around low sec and actually killed a Thrasher that attempted to gank Wandering Rose while she was mining in a .2 system. But normally my PvP consists of see player, run from player. That may change in 2013. I have the learned skills to succeed in PvP on Rosewalker and with the diversion in my skill plan to ensure I can fly all the battlecruisers I can not only fly all of the Minmatar well but also all of the Caldari missile boats up to the Drake. Once I finish getting all my scan probe skills up to 5 I can work on the other races weapons and electronic warfare skills. I do have another option mentioned by Andski in the article and use an alt. I have a third account in which I'm training industrial alts. Currently I have two characters, an Amarr miner and a Gallente transport pilot who will finish the current skill plan on 1 January. Both characters either have or will have the Core Competency certificate trained up to Standard by the end of the year. Training the gunnery and ship command skills shouldn't take too long. Or I could just create another Minmatar pilot to begin the year and go out to low sec with guns blazing. Why not? My alt could fly the Minmatar ships Rosewalker can fly, just with minimal skills instead of all the support skills at 5. If I do that when I take Rosewalker out on a roam combat will seem much easier. Maybe even join RvB and stay nice and safe in The Forge. Oh, that's part of the reason I don't take Rosewalker to RvB; he isn't well liked by the Caldari police. One other event makes getting into PvP more attractive: Retribution. With CCP revamping so many ships the whole metagame is changing. This is probably the time to jump in, get my feet wet and learn with everyone else. I'm not saying I will absolutely, positive jump into PvP and become the terror of New Eden. Rawr! The picture in my mind of that makes me laugh in real life. But changing the way I play is always a possibility and and if I have learned one thing about Eve is that change is the only constant. Back when I first started playing Eve Online I also played EverQuest 2. I found I could make some money in Eve while playing EQ2 by parking a Mammoth in a belt fit with a Mining Laser II and letting the cargo hold fill up. I wasn't AFK because I use one keyboard to control two computers so I could just glace up and check on my mining industrial from time to time. Of course as I started playing more and made Eve my main game I got out of the habit of doing so because I was too busy playing on my main accounts. When I read Sugar Kyle's post about her new Orca I thought "why aren't I doing that?". Sugar Kyle has an alt account that she uses for just mining. Now, I just can't do that while playing Eve because I can't multi-task that well, but I could put the industrial alt I created on a third account in an old Retriever in a belt while I play Guild Wars 2. Or maybe even a Mackinaw. With the new improved ore bays those ships actually can carry more ore than my old Mammoth. I just need to make sure my strip miners don't go silent, but I should be able to do that easily. Perhaps I'll start tonight, if I get home at a decent time. The only problem I have is that Wandering Rose is the only pilot I have with both the skills and the standings with various NPC corporations to have perfect refining anywhere. Time to outfit a new clone with suitable implants so I don't lose training time when I clone jump? Oh good, another project to keep me busy. I have to admit I am in a bit of a holding pattern where Eve Online is concerned. With the Retribution expansion less than a week away I don't feel like doing much in the game. My favorite combat ship the Hurricane. Getting nerfed. I can finally fly the Drake. Heavy missiles getting nerfed. Courier missions in low-sec? With the changes to Crimewatch that's about to become more dangerous as well. If carebears were afraid of traveling in low-sec before, I think they'll really have a reason to fear now. I don't want to develop bad habits. I want to get into the proper mindset before the changes come along. I guess I could log onto the Buckingham test server and do some theory crafting, but I'm doing a lot of that in real life right now and I just want some mindless fun. Since Retribution will involve changing the way I think inside Eve I'm spending a lot of time in Guild Wars 2. I always find that when I play another MMO and then switch back to Eve I need to make mental adjustments. Since Retribution involves making mental adjustments anyway I might as well get GW2 out of my system before the expansion hits. I do have to admit that once I hit the part of the personal story where I joined the Order of Whispers I started liking the game more. A couple of days ago I bemoaned the voice acting in GW2 that led me to choose to play a female human. But the combination of my red-headed ranger and the char engineer Lightbringer Tybalt Leftpaw is just so, well, cute, that I'm changing my mind and deciding that everything is turning out for the best after all. 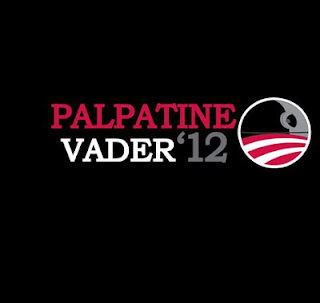 As for Star Wars: The Old Republic? I don't think I'm going to continue that game. One, I really can't imagine playing three MMOs at once and two, the combat in GW2 is just better. I was using a long bow with the axe/war horn combination and switched out the long bow for the short bow. Combat became a lot more fun as I'm moving around trying to get flanking positions. The short bow is good for single targets, the axe is good for multiple targets and the war horn has a skill, Hunter's Call, that reminds me of the EverQuest 2 ranger ability Hawk Attack, except better. Hopefully I'll snap out of the funk this weekend and become motivated after watching the last weekend of the New Eden Open. With fewer matches I expect to see CCP to use the opportunity to showcase the changes to Retribution. Of course, watching the Own3d.tv stream means I won't be logged onto Tranquility, but I can't have everything. The rankings of the top twelve MMORPGs as determined by the players of the Xfire community from play on Sunday, 25 November 2012. For more details about the methodology, click here. Historical data can be found here. The Thanksgiving weekend in the United States took its toll on the gaming time of the Xfire community with 7.1% less time spent playing MMORPGs than the previous Sunday. The games facing the biggest declines were Guild Wars 2 (-32.8%) and the two games that fell off the list, Maple Story (-21.5%) and Rift (-20.5%). The three games that barely managed to defy the trend were Aion (+1.5%), Lord of the Rings Online (+1.1%) and Eve Online (+0.5%). Planetside 2 debuts. While the beta version of SOE's Planetside 2 made appearances on The Digital Dozen, the game made its release debut on the list at #4 Sunday. Here are how some other games fared on their first full release weekend this year. The Secret World: Rank #3 - 6,002 hours played. Dog Bites Man. Once again the Xfire community showed its fondness for shiny new objects is short-lived. As expected GW2's The Lost Shores patch failed to maintain interest as playtime in the ArenaNet offering dropped 32.8%. Trion didn't fare much better as Rift saw a 20.5% decrease in playtime less than two weeks after the launch of The Storm Legion expansion. In comparison Bioware did rather well with the introduction of the free-to-play model to Star Wars: The Old Republic as the game only experienced an 11.3% decline in play. This weekend I didn't spend much time in Eve. Most of my Eve time was spent watching the New Eden Open, listening to Arydanika's interview of CCP Fozzie on Voices from the Void #60 or doing a research project. So when I logged into games this weekend, I chose Guild Wars 2 and Star Wars: The Old Republic. Guild Wars 2 isn't a stretch because I've been playing the ArenaNet game for a few hours a week but I logged into SW:TOR to see if the free-to-play implementation is as bad as I've heard. One thing they both have in common is some bad voice acting. Why is the voice acting important? Because I wound up playing female characters in both. Now, I do have a history of playing female characters. In EverQuest 2 I played a female wood elf because I really wanted to play a wood elf ranger. But when I rolled a male wood elf, the character looked so much like a female that I decided to just go ahead and roll a female character. When I went back to take a look at World of Warcraft, I rolled blood elf females because they looked like they could easily beat up their metrosexual male counterparts. At least in Eve Online I didn't create a female pilot because of the way the men looked. I was creating a CEO for my personal corporation and since the lore states that Vherokior women are very good at business I decided to go that route. I really wanted to play a male Imperial Agent in SW:TOR. The thought of the whole cold blooded secret agent with a British accent concept is really appealing. Too bad that when I played a male Imperial Agent before the game became free-to-play that the actor's voice just drove me crazy. He sounds like a giant prick. So I currently have a level 3 female Imperial Agent with a voice that sounds the way I think a secret agent should sound. The actress who does the voice, Jo Wyatt, also does the voice for the female Hawke in Dragon Age 2. Maybe I should pick up that game instead of continuing with SW:TOR. Speaking of bad voice acting, I just have to say that Guild Wars 2, while a game I'm enjoying, does have some really bad voice acting. I deleted the first character I rolled, a male Asura Engineer, because I just couldn't stand the sound of my character's voice after 5 minutes. I wound up playing a female human ranger because while her voice is sometimes annoying, at least I don't relate the voice as coming from me. I really like the concept of story and voice acting in video games. I am, however, beginning to despise voice acting in MMOs. When the voice acting drives me away from content, that's when I start getting irritated with a game. Yesterday one of the major gold selling sites that I identified Monday as experiencing supply problems, Koala Credits, took Eve Online off of the list of games in which it sells virtual currency. The virtual currency seller apparently began to experience issues obtaining ISK at the end of October. Many companies began raising prices around this time as CCP's Team Security began a crackdown on illicit RMT operations in New Eden. But of the ISK selling sites listed on MMOBUX Koala Credits raised prices the most, a whopping 27.9% 38.7% over the course of three weeks. At the end, Koala Credits was selling ISK at the same price a player could get by purchasing two PLEX from CCP and selling the PLEX in Jita. If a company cannot provide a significant discount to compensate for the risk involved in a player purchasing game currency from a third party site, the site will eventually lose money. Koala Credits apparently cut its losses and will concentrate on the 33 games in which it still conducts business. 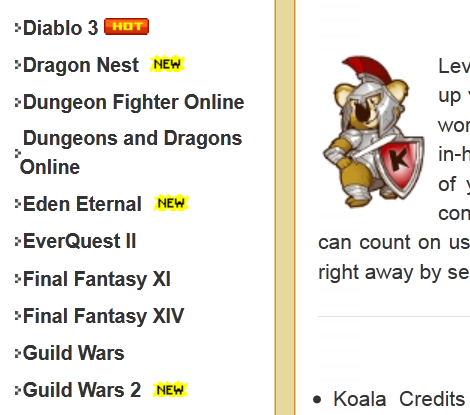 Koala Credits is a rather new virtual currency company based out of Hong Kong that is the #1 rated web site on MMOBUX for customer satisfaction. Koala Credits is also the second major virtual currency company to stop selling ISK this month. Sometime between 4 November and 11 November the Canadian website InGameDelivery also got out of the ISK selling business. InGameDelivery is currently the #2 ranked web site on MMOBUX based on customer satisfaction. Both sites are still in business, just not selling ISK. 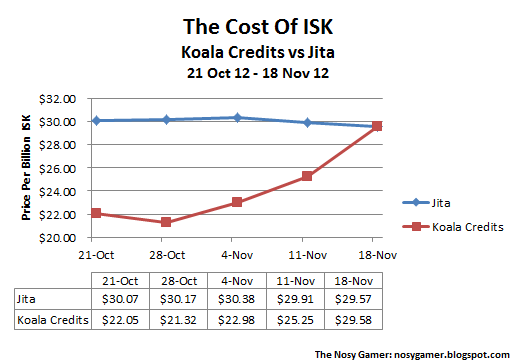 Added 7 December 2012 - With the launch of the Retribution expansion Koala Credits returned to the ISK selling business. They began listing ISK sometime between 3-6 December. Late word coming out of Against ALL Authorities is that Psyco Groupie, a director of The Maverick Navy, was the pilot referred to in the leaked Eve mail on Eve Skunk stating that a call to arms was cancelled due to the banning of 20 logistics accounts. More importantly, CCP has cleared Psyco Groupie of all wrong-doing and reinstated all of his accounts. I received word last night that all 20 accounts in question belong to Psyco Groupie. According to Psyco Groupie he purchased two accounts on the official Eve Online forums. These accounts transferred assets to the owner's main accounts and then the owner RMT'd the ISK before leaving the game. Upon review the GMs determined that the illicit RMT activity all occurred before Psyco Groupie took control of the pilots. As is CCP's custom when mistakenly banning a player, Psycho Groupie received a "generous amount" of game time for his accounts. I still have questions. 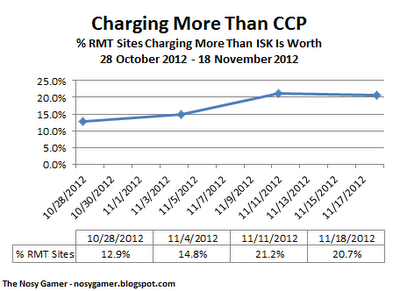 Just how many accounts did CCP ban for RMT in order to see the price increases for illicit ISK like we have over the past three weeks? How many alliances will eventually get hit? Have any POS exploded yet? And what happened this past weekend to make the prices at Avatar Bank and Koala Credits jump so much? I should add one warning. Be very careful about buying characters, even on the Eve Online forums. Perhaps I've spent too much time on botting forums but I would never purchase a character. Too much risk of what happened to Psyco Groupie happening to you. The rankings of the top twelve MMORPGs as determined by the players of the Xfire community from play on Sunday, 18 November 2012. For more details about the methodology, click here. Historical data can be found here. In one of the wildest weeks in the short history of The Digital Dozen the members of the Xfire community increased the amount of time spent playing MMORPGs by 7.6%. The games gaining the most playtime in percentage terms were Star Wars: The Old Republic (123.9%), Maple Story (74.5%), Rift (52.7%) and Guild Wars 2 (32.5%). The games seeing big declines in playtime were The War Z (-32.7%) and APB Reloaded (-23.2%). A Deluge of Content - Apart from Maple Story the games with the biggest gains all released new content. On 14 November Trion released Rift's first expansion, Storm Legion. The next day Bioware released patch 1.5 for SW:TOR, turning the game free-to-play. And on Friday Guild Wars 2 saw the launch of a major live event and a new dungeon, The Lost Shores. I expect to see GW2 resume a slide downwards but how will SW:TOR and Rift do in the coming weeks? The Trifecta - For the first time since 15 April Xfire players spent more than 10,000 hours playing three different MMORPGs: World of Warcraft, Guild Wars 2 and Star Wars: The Old Republic. Back in April the three games were WoW, SW:TOR and Aion. Updated Data - After a month's delay I have updated the Google document with all of the Xfire data collected. Most of the data goes back to shortly before the games made their first appearance on the list, but some games like WoW, SW:TOR and Eve Online have data back to the beginning of the year. When word leaked out from Eve Skunk that Against ALL Authorities fleet commander Lee Chanka cancelled a call to arms due to CCP banning 20 -A- logistics accounts one couldn't help but wonder if the Eve mail was just a troll. A look at the price on illicit ISK in Eve Online since that email on 31 October strongly suggests that has taken action against at least one major RMT operation in New Eden and perhaps more. At first glance the price appears to have not increased very much. Using the list of companies listed on MMOBUX as a guide, the median price of 1 billion ISK only rose from $22.00 to $22.50, an increase easily attributable to increased demand as the winter expansion Retribution approaches. 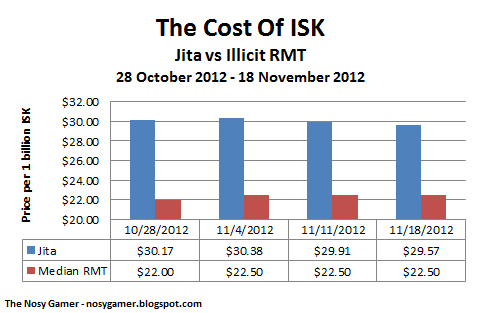 The 2.2% increase in the cost of illicit ISK corresponded with a 2% decrease in the real-world decrease in the cost of ISK when buying PLEX through CCP and then converting the PLEX to ISK in the Jita market. But a closer look shows that some companies are having difficulty acquiring new product. Fully 1 in 5 websites listed on MMOBUX were selling ISK at a higher price that someone could purchase the same amount by just purchasing 2 PLEX from CCP and selling the PLEX in Jita. Three weeks ago that number was 1 in 8. One of the big selling points of purchasing virtual currency via a third party site is obtaining a cost savings. How can an RMT company stay in business if they charge more than the game company? 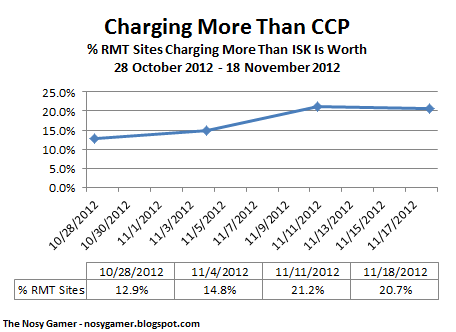 That could explain why two of the four websites selling ISK at above market rates on 28 October are no longer online. Looking at the 26 websites listed on MMOBUX on 28 October that are still listed today, nine of the companies raised their prices an average of 15.7%. Two of the larger companies in the virtual gold selling industry, Avatar Bank and Koala Credits, were hit especially hard. Koala Credits raised its prices 7.8% in the days following the leak of Lee Chanka's Eve mail. Avatar Bank apparently was hit a few days later with a major disruption in supply as the company had raised its rates by 18.5% by 11 November. Apparently another suppy disruption occurred within the last few days because both websites raised their rates to over $29 per 1 billion ISK yesterday. Over the last three weeks Koala Credits have raised prices 27.9% and Avatar Bank by 21.1%. One of CCP Sreegs' stated objectives is to make operating in Eve financially unattractive to botters and ISK sellers. This latest offensive against illicit RMT operations succeeded in that regard as one web site, InGameDelivery, no longer sells ISK. That move came sometime between 4 November and 11 November. One of the interesting facts I discovered while investigating this story is that InGameDelivery is associated with Avatar Bank. Apparently when Avatar Bank found ISK in short supply the decision was made to cut off InGameDelivery. During my time playing Eve Online I have often heard the phrase "winter is coming" when discussing when war would begin in null sec. For those whom CCP Stillman and CCP Sreegs warned about turning their alliances into RMT operations, winter is apparently here. With CCP ramping up the excitement for Retribution with a spate of dev blogs the time has come to look at how Inferno did at drawing people into actually logging in and playing Eve Online. 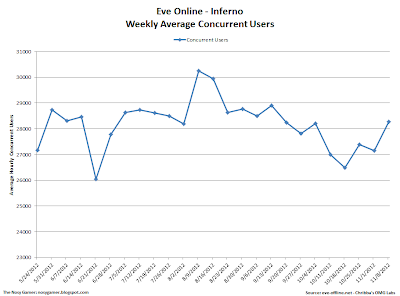 Taking the weekly averages from Eve-Offline.net led to a graph that looks a bit unusual. One item that sticks out is that despite the controversy over the Unified Inventory that the average number of players on Tranquility rose by 1,500 - 2,000 per hour until the middle of September except for a dip in the middle of June. The big spike over 30,000 users per hour occurred right before the release of the Inferno 1.2 patch. But then following the release of Inferno 1.2 the number of users declined by 11.5% until the ramp-up to Retribution began. Did the traditional summer/autumn decline cause the player activity observed? I took the seasonal data from 2007-2011 I gathered earlier this year and compared the data to this year's results. The numbers for May stand out because Eve saw almost 10% less players on Tranquility in May compared to April when May is usually a very stable month. Was that the outrage over the Unified Inventory? No. Diablo III came out on 15 May and the run-up to the launch of the Blizzard game led to a loss of players in all games. 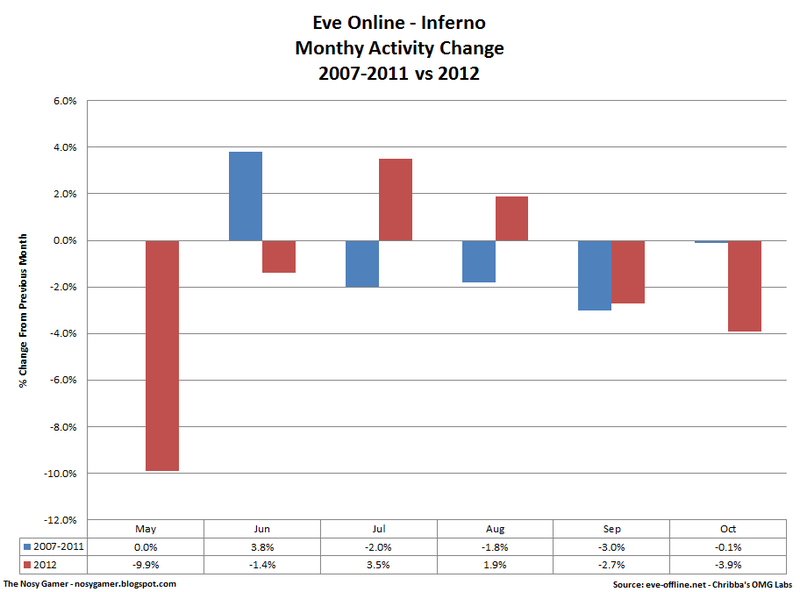 I believe that the rises in both July and August were caused by players returning to the game from playing Diablo III. However, I do believe that part of the rise in players at the beginning of August was due to the deployment of Inferno 1.2 and the ship changes. But that did not last very long as logins steadily declined until the middle of October. The last mystery is why the decline in September and October. The 2.7% decline in September is close to the 3% average decline experienced from 2007-2011. But what about October? While pointing to DUST 514 as the cause is tempting, Eve-Offline shows that the concurrency numbers on Singularity did not top 200 over the past few months. A more likely explanation is the price of PLEX. 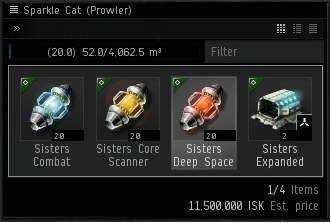 On 1 September the price of a PLEX in The Forge averaged 498,999,998 ISK. By 10 October the price of PLEX had risen 29.7% up to an average of 647,101,002 ISK. While that price is good for the fight against the illicit ISK trade, I believe a lot of players who funded their subscriptions using Eve's in-game currency found themselves unable to pay for subscriptions to some if not all of their accounts. With the prices Tuesday down 9% from the all time high we may see the concurrency numbers rise, but possibly not back to the August numbers before the launch of Retribution. So was Inferno a strong expansion? 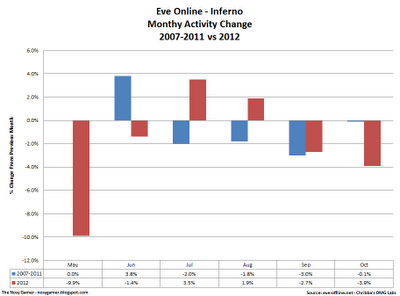 One could argue that in the face of the Diablo III juggernaut that Eve saw growth once Inferno launched. But Eve saw a decline as inflation in the PLEX market took its toll on players paying for their accounts in ISK. I think history will show Inferno as a middle-of-the-road expansion, at least in terms of player interest as the concurrency numbers likely will be higher at the launch of Retribution than they were at the launch of the spring 2012 expansion. Last night was my longest gaming session in any game all week. I logged into my Prowler, traveled two jumps, bought 3 skills books, injected them into my skills queue and logged off. Needless to say I don't have any good stories to tell but I have collected a few thoughts over the past few days. The first is the latest kerfuffle occurring concerning the Eve Blog Pack and other ways of disseminating blogging posts. I don't want to go into the fight because then I have to discuss Eve politics and I don't have time. But having followed the Tobold/Syncaine feud I can say the Eve blogosphere hasn't reached the boiling point yet. I do feel the need to remind all the Eve bloggers about one of the biggest rules in video game blogger fight club: only start a feud on Fridays. The next thought came from reading a post by Sugar Kyle commenting on the colors not only in Eve but on Eve-related web sites and blogs. That reminded me of the book I'm currently reading, Neal Stephenson's Reamde. I'm about a third of the way through the book and colors, more specifically the brightness of colors, plays a part in driving the plot. I think I'm at the part of the book where, if Mr Stephenson was writing about Eve, my Prowler is about to be fitted with a Doomsday device. Finally I've been scanning the major news sites (TheMittani.com and Eve News 24) and since the one email leaked by Eve Skunk stating that some Against ALL Alliance pilots were banned for illict ISK selling I haven't heard anything since on the subject. Is nothing going on? Or do people just don't care? With CCP recommending everyone race to train up their Destroyer and Battlecruiser skills, one question I think few are considering is the effect on Command Ships. No not the class; CCP Ytterbium stated that after tech 1 battleships are balanced that command ships are next on the agenda. No, I'm referring to the actual skill. A quick glance shows that one of the requirements for Command Ships is Battlecruisers V. With this skill about to change into racial variations of Battlecruiser, does this mean that we are about to see racial versions of Command Ships? I don't think so and I'll explain why shortly. But whatever the decision I don't see how CCP can make the changes to the Battlecruisers skill without changing the Command Ships skill. "For tech 2 ships, it creates an overcomplicated nest of skill requirements, as you need both the Cruiser and Battlecruiser skills to 5 to train for a Command Ship for example..."
"Tech 2 philosophy is all about specializing into a specific hull and role, thus, requiring players to train for Assault Ships, then Heavy Assault Ships when aiming for Field Command Ships, is quite redundant." From the hints given so far, I expect CCP to remove Racial Cruiser V as a requirement to fly command ships and replace it with Racial Battlecruisers V. I then think that with the elimination of Battlecruisers as a skill that Command Ships will see two new prerequisites, probably Assault Ships IV and Logistics IV since CCP is removing the field and fleet classifications. I would have picked Heavy Assault Ships IV except for the comments in the March dev blog. [ADDED] - Of course, if Assault Ships IV and not Heavy Assault Ships IV is required, that leaves training room for what I consider a must-have skill for flying command ships, Warfare Link Specialist. I would think that in order to meet the goal of less training time to fly command ships that CCP would make Warfare Link Specialist IV a prerequisite for the Command Ships skill. Also, as CCP is balancing command ships against tech 3 cruisers for gang boosting utility, requiring the skill fits in with the role CCP envisions for the class. Making this move would make learning to fly command ships on par with all other tech 2 ships: learning the racial ship class skill to V and then learning a specialized skill like Interceptors or Recon Ships. Instituting the change would also result in another "If you could fly the ship before, you'll be able to fly the ship after" moment as some people probably skipped either Heavy Assault IV or Logistics IV on their way to flying a command ship. Could we see another skill point rush like we are currently witnessing with the Destroyers and Battlecruisers changes? I don't think so until CCP announces the final changes. The rankings of the top twelve MMORPGs as determined by the players of the Xfire community from play on Sunday, 4 November 2012. For more details about the methodology, click here. Historical data can be found here. Many players who use Xfire apparently took Sunday off as the number of hours spent playing MMORPGs fell by 12.1%. The non-beta games that saw the biggest decreases were Maple Story (-46.1%), Guild Wars 2 (-10.7%) and Metin 2 (-10.2%). Games bucking the downward trend were led by Mabinogi (+8.9%), Star Wars: The Old Republic (+7.8%) and Eve Online (+6.1%). Technical Difficulties? I wonder if Xfire was experiencing some technical difficulties this past weekend that lowered the numbers for some games. For example, Star Trek Online fell from 1026 hours played on 4 November down to 11 hours Sunday. A Week Early - I was not expecting big declines in World of Warcraft and Guild Wars 2 until next weekend due to Star Wars: The Old Republic going free-to-play on 15 November. I think a lot of players who tried SW:TOR but then left for WoW or GW2 will return to SW:TOR if only to finish up some of the stories. I doubt that SW:TOR will surpass GW2 but stranger things have happened. Seven Days And Counting - Another F2P game scheduled to launch next week should shake up the listings. Planetside 2 launches on 20 November and opened its servers 24/7 last weekend. The beta still saw 14.8% fewer hours played Sunday compared to the week before but hopefully the bugs will be worked out for the final beta weekend. "As a reminder, we would like to state there are no skill changes planned for the winter expansion - your Destroyers and Battlecruisers skills are safe for now, as we are not adjusting spaceship command skill trees until we are done with the Battlecruiser class." I know that I still have a lot of time to take advantage of the training changes coming with CCP's tiericide efforts but with the latest dev blog discussing battlecruiser and battleship changes I figure I need to take care of business before I forget. "Let us repeat again: if you could fly it before, you will be able to do so after the change. Technically it means if you are able to fly an Oracle by having Amarr Cruisers 3 and Battlecruisers 3, we will remove the Battlecruisers skill from your character and give you Amarr Battlecruisers at 3. If you had Battlecruisers at 3 and Caldari Cruisers 3 instead, you would not receive Amarr Battlecruisers but the Caldari Battlecruisers skill at 3 instead. The same principle work with the Destroyers skill." Antoine Jordan: "So if I have Battlecruisers V and Amarr Cruiser III, after the patch I'll have Amarr Battlecruiser V, right? So that I can fly them to the same effectiveness I could before the patch." CCP Fozzie: "This is correct." So all I need to do is train the three racial Cruiser skills I don't have to III and I will have Battlecruisers V for all races. As a byproduct of the requirement to train the racial Frigate skills to IV before beginning Cruiser training, I'll also have Destroyers trained to V as well. The nicest part is how long the training takes for me. Even with my attributes not min/max'd each of my pilots will finish in under nine days. Nine days. Yes, I know that I still have to learn the gunnery skills to fly the ships properly (well, except for the Caldari missile boats). But for the eventual payoff I think I can divert nine days of training for support skills on both my pilots to have a big payoff down the line. I can't wait for the spring expansion. I set a goal for my week of vacation to work on my scanning and finish setting up a second base in low sec. With three days to go I'm doing pretty well and just need to bookmark the new constellation I'm moving to. As simple as this sounds I've had a bit of an adventure over the past few days. My first task was to acquire a set of Sisters' scanning gear. I had already run the level 4 missions to get the loyalty points and all I needed to do was purchase them. But purchasing the gear required having the base versions of the equipment. No problem right? All I have to do is go to a trade hub, buy the stuff and bing, bang, boom I'm done. The only problem was I wanted to manufacture my own gear as much as possible. Making the items isn't really difficult. I just needed to go and purchase the blueprint originals from an NPC and then put the items in a factory. I had all the minerals mined and refined that I needed already except for some strontium clathrates I needed to make the combat and deep space probes. Easy right? Just go out and mine some dark glitter, get about 7 or 8 cycles and I'm done. Did I forget to mention that the Minmatar Republic only has one ice belt containing dark glitter? But I decided to go for the challenge and mine dark glitter instead of going off to a more remote system and mine glare crust. So I loaded up a Procurer I hadn't unpacked yet, picked up some ice mining modules and Wandering Rose headed off to Todifrauan in my Prowler accompanied by Rosewalker in his Hound. Things went well and I mined three units of dark glitter before a German player in a Hurricane decided to try to gank Wandering Rose. She got away easily and with Rosewalker keeping an eye on the ice belt watched the Hurricane warp off. I saw the pilot leave local, waited a few minutes and then tried to begin mining again. The Hurricane came back and once again I warped off. I don't think the Hurricane pilot realized I was watching him. I decided to take the ice I had already mined and started manufacturing a batch of combat probes. I have to give that Hurricane pilot credit for patience. I played cat and mouse with him for maybe an hour until a birthday fleet of about 100 ships rolled into the system. They were having so much fun spamming "happy birthday" that while the German docked up I sped out to the ice belt and mined six additional cycles. I guess flying a cheap ship like the Procurer made me less risk adverse than the Hurricane pilot. So with having more ice than I needed I finished making the last of my items. Once made I went to the nearest Sisters of Eve station and purchased my goods. Of course once I had the good gear I had to go out exploring. 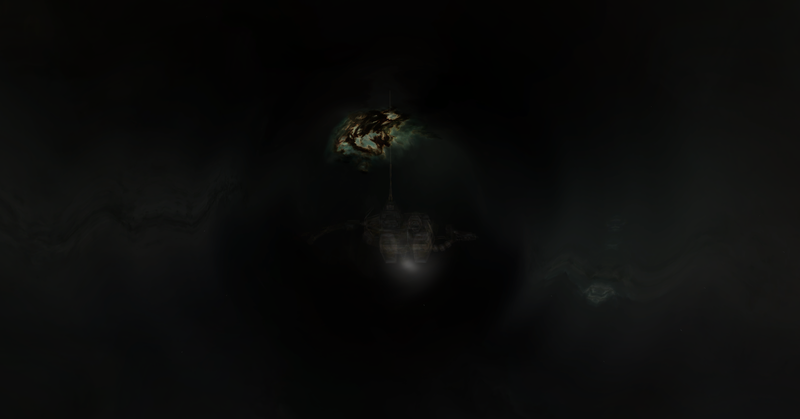 I found two wormholes and decided to enter my first wormholes since leaving Eve University. The first wormhole I entered was populated with POCOs from a Russian corporation. That explained why I see so many Russian pilots flying around my system. In the second wormhole I entered I broke one of the cardinal rules of wormholes: I forgot to bookmark the wormhole before warping off. I did want to use my new gear but I didn't really want to do so trying to find my way out of a wormhole. I scanned down two wormholes pretty quickly. The first wormhole I found led to Gallente low sec 22 jumps away. I reentered the wormhole and went to the second one which led back home. The second goal is to set up a second base in low sec. The first part I needed to accomplish is to get the standings with the Republic Fleet for the station so I can have perfect refining. During the standings grind all the storyline missions I did were for The Leisure Group and I wound up getting my standings up to 7.3 with that corporation in addition to standings of 6.7 with the Republic Fleet. After finishing the grind I realized that I now have perfect refining in at least one station in every .1 and .2 security system in the Minmatar Republic except for Todifrauan. To get that the easiest way is to grind faction with the Pator Tech School. If I want to run level 4 missions I either have to go to high sec or go to a couple of places I really try to avoid: Amamake and Molden Heath. Do I dare venture into the pirate stronghold of Molden Heath? I might cheat and do the faction grind in high sec so I can explore wormholes in relative safety when I get tired of running missions. I understand that high sec spawns class 1 and class 2 wormholes which should prove easier to operate solo in. So all I really have left to do is bookmark the constellation where I plan to set up a second home. I may not finish the entire constellation but I should manage to get enough bookmarks made to begin operations. As I was surfing the web last night I ran into an article on Kotaku discussing cuts at the National Defense University that would cut into the NDU's ability to conduct wargaming of potential real world scenarios. That reminded me of a game I used to travel to game conventions to play many years ago, the National Security Decision Making Game. I decided to see if the game was still up and running and I was glad to see an active Facebook page. The game is quite interesting for those interested in current events. Over the course of eight hours players are placed into different country cells in which they play national leaders, members of the legislature and representatives of various interest groups like business, dissidents and the media. The cells are usually placed in separate rooms with the control staff (think D&D dungeon masters) in communication using short-range radio. Some players are drafted to play what are in effect non-player countries and are known as facilitators and help the control staff move the scenario along. Usually at the end of the day the scenario winds up with a major international crisis and sometimes the bullets fly. Watching the procedure for the release of a country's nukes is always interesting, especially if a player loses the codes. Yipes! Eve Online, with its interstellar economic and military simulations combined with its diplomatic, intelligence and propaganda metagame is the closest I've come to the NSDMG outside of a convention. Where the NSDMG control staff has to condense three or four years into an 8 hour session, conflict in Eve runs in real time and can last for months or even years. I should add that in both games lying and backstabbing is not only encouraged but rewarded. The other distinguishing feature of Eve compared to NSDMG is that Eve takes place in a fictional universe in pixel space. NSDMG takes place in our world, although I see that since I've played that the staff has put together historical scenarios to run through. The modern scenarios did start to get to me following 9/11 and combined with work led to me last playing at GenCon in 2003. In fact, I hadn't attended another game convention until I traveled to Reykjavik for Fanfest back in March. Thinking about all the good times I had makes me want to attend another convention and play again. The schedule for 2013 isn't up but maybe the crew will set up for a 24th year and I can play again. With stagflation, the fiscal cliff and a military intervention in Mali either here or on the horizon what did I do on Monday to prepare? That's right, I bought a PS3. I've never owned a console system but I figured if I ever wanted one I better buy it before inflation really hits. And yes, I do my own grocery shopping so I know inflation's here, I just expect it to get worse. Like Jimmy Carter worse. I didn't get the system just for playing games. I already have a Hulu Plus account so I expect to use my PS3 to watch movies on my big screen tv instead of moving my laptop around. And I've always wanted a Blue-Ray player. Does this sound like excuse making for spending a lot of money on a game console? I bought the Uncharted 3: Game of the Year Bundle that also has the DUST 514 content pack from Best Buy since my credit card is giving me 5% back on purchases from Best Buy this quarter. I figure I need to get a first person shooter, which I never play, in order to prepare for DUST and not look like a total noob. Because frankly that's what I am when it comes to console games. That leads to another concern. I need to learn how to use the controller if nothing else and playing games should help. So what games should I look to buy? Right now I'm looking for something I can play single player so I don't embarrass myself. If anyone has any recommendations please send them my way. And one more question. How do I get a beta key for DUST? EDIT: Just saw that Midway Arcade Origins was announced yesterday. To give you an idea, those are among the most recent console games I've played. The rate of decline in the time the Xfire community spends playing MMORPGs slowed Sunday with the time only dropping 3.6%. The games with the biggest percentage gains were The War Z (+142.9%), Maple Story (+14.7%) and Planetside 2 (+12.8%). The games experiencing the biggest declines were Vindictus (-22.1%), Guild Wars 2 (-21.2%) and Metin 2 (-16.7%). Server Stability - This week two of the three games that gained the most play time percentage-wise were not officially released. The War Z, which opened in alpha on 16 October to laggy servers due to massive interest by zombie hunters, expanded its server capacity and the players poured in. From following Sony Online Entertainment CEO John Smedley's Twitter account, Planetside 2 is working on a lot of issues and the San Diego studio fixed a lot of bugs last week. Bargin Buying - This week once again shows that the Xfire community loves a bargain. Maple Story returned to The Digital Dozen after a six week absence as players learned last Tuesday that Wizet was taking away the ability to create six classes on 13 November combined with special pets available in the cash shop in honor of the U.S. presidential election. On the downside, Metin 2 lost significant time played due to the expiration of an offer. After rising to its highest ranking of #4 last week, Metin 2 fell three spots even though the cash shop promotion that began 26 October runs through tomorrow. The declines following a promotion sometimes come after players have already taken advantage of a deal and doesn't wait until the offer actually expires. Event Aftermath - Another trend is that following in-game events interest in a game tends to decline. Two games that held in-game events on 28 October saw the Xfire community spend over 20% less time playing those games on Sunday. Vindictus fell out of The Digital Dozen after a nine-week run with a 22.1% decline following the celebration of the Nexon game's second anniversary 27-28 October. The second game, Guild Wars 2, experienced a 21.2% decline with the end of its Halloween event. With both Eve News 24 and TheMittani.com reporting that at least 20 pilots from Against ALL Authories banned for participating in the illicit ISK trade based on a leaked Eve mail on Eve Skunk, I decided to look for evidence that ISK selling web sites are feeling any shortages. Getting information on the illicit trade in virtual currencies in MMORGPs is difficult. In lieu of attempting to create my own database of sites I use MMOBUX to try to track the illicit ISK trade. 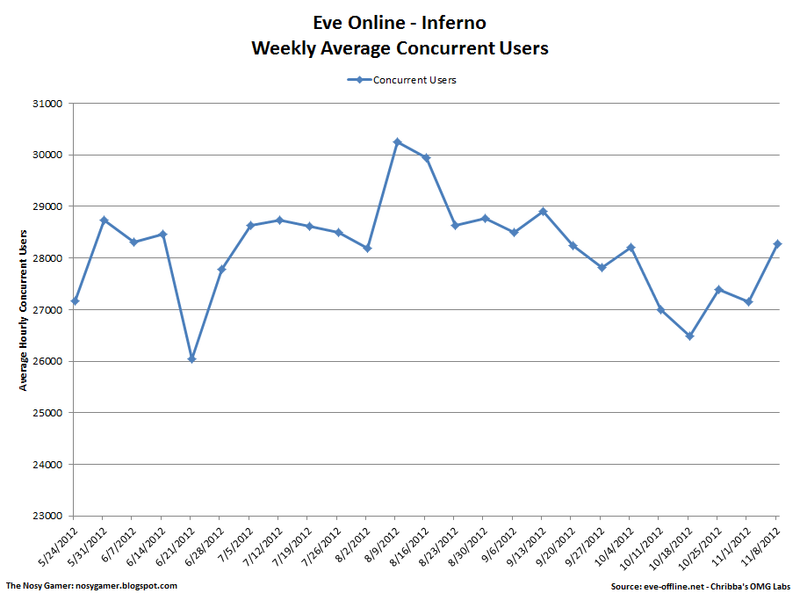 Over the past week the activity concerning Eve Online has increased. Since last Sunday the median price of ISK sold by the companies listed on MMOBUX rose from $22.00 / 1 billion ISK to $22.50 / 1 billion ISK. Overall 5 sites increased prices while one site lowered its price. During the last seven days MMOBUX delisted six sites, including Igeve.com which apparently is out of business, while adding two new sellers, reducing the number of sites listed from 31 down to 27. Looking closer into the numbers shows something interesting. Most of the activity took place amongst the sites selling ISK the cheapest. Looking at the thirteen web sites offering the lowest prices, 5 sites raised prices and 4 sites were delisted. The five sites raised prices an average of 7.1%. I don't think the rise in prices is necessarily a result of the increase in the price of buying ISK using CCP-approved PLEX. Over the past week the decline in the price of PLEX resulted in a rise in the approved trading of ISK1 from $30.17 up to $30.35. So is the price hike due to the actions of CCP against alliances engaged in the RMT trade? If so, this week's rise in price should be the first of many to come. Due to the low price of ISK by purchasing PLEX through CCP compared to the prices charged by the illicit ISK sellers I doubt we will see a near tripling of the illicit ISK price as happened followed Unholy Rage. That means that another successful attack on the illicit ISK network in Eve could see a reduction in companies selling ISK. 1. Price determined using average price of PLEX in The Forge and purchasing 2 PLEX ($34.99). Next week I'm taking time off from work to rest and recuperate. I might even take a day or two off from blogging if I get involved in something interesting. Or I might blog more if Team Security becomes more active. But before I go off and lose myself in the world of relaxation I have a few thoughts. CCP Stillman Unleashed? I thought the ban wave for illicit RMT activities would wait until CCP Sreegs returned from paternity leave. Apparently not, because both TheMittani.com and Eve News 24 are reporting that Team Security has pushed the button, with Against ALL Authorities forced to cancel a CTA due to the ban of 20 logistics pilots for engaging in the illicit RMT trade. Looks like I need to step up my game, although my weakest area of coverage on The War on Bots™ is null sec. The MSM catches up to TheMittani.com - Those of us in the Eve community knew about Sean "Vile Rat" Smith's observations that the bad guys were scouting out the embassy in Benghazi from reading TheMittani.com. Now Foreign Policy is reporting that those concerns were reported to the authorities at the time. CBS also came out with a scathing story about the Obama administration's reaction to the Benghazi attack. First Fast and Furious, now Benghazi; the president must really hate Sharyl Attkisson right now. Eve Online - Next week I get some quality playtime and I'm going to work on my scanning and finish up my prep work to set up a second base in low security space. Guild Wars 2 - I'm finally past the human starting area into Kessex Hills. Gathering the materials to get to 75 for my crafting skills was a pain, but I liked the discovery process in which I got my crafting recipes. I was reminded of opening packs of Magic: The Gathering Cards back in the day, except with no addictive new card smell. I'm at level 24.5 now. Maybe I can make level 30 by the end of the week. Reamde - I'm behind on my reading but have picked up Neal Stephenson's Reamde and hope to finish it next week. I first heard about the book from a post by Rutgers law professor Greg Lastowka on Terra Nova. A book in which real money trading in incorporated as a main part of the plot? Sounds interesting. That's all for today. People may actually see me in game and know that I'm not a unicorn. I usually consider CCP's War On Bots™ as beginning in March 2011 with CCP Sreegs' security presentation at Fanfest 2011. But the Icelandic game company has battled botters and the illicit RMT trade long before CCP Sreegs arrived on the scene. While doing some research on illicit RMT I ran across and article on MMOBUX discussing the jump in price of illicit ISK in the aftermath of Unholy Rage in June 2009. The article states that the price of illicit ISK rose from $25 / 1 billion ISK to $65 / 1 billion ISK as a result of Unholy Rage as illicit ISK selling sites were ravaged by the operation. The interesting bit of information was the speculation surrounding how CCP uncovered so many illicit ISK operations at once: the EBank scandal. "One potential cause for this massive strike against ISK farmers could be the recent case of a player defrauding an in-game bank which he ran. The according to the game-rules 'legally' embezzled amount was valued at roughly 5000 USD. It is possible that this highly publicized case lead the Iceland-based developers of the game on the trail of major currency trading operations. "Ricdic, as the former CEO-gone-rogue of the bank called himself in the game, acquired a currency amount probably too large to sell to any single company alone. In the process of getting rid of his hot goods and transferring them in return for real USD, he probably revealed several large currency trading networks." The article reveals a few interesting facts about the illicit ISK selling business back in 2009. First, the price of ISK is down approximately 12% today as compared to 3 years ago. The second is that no company was able to process 200 billion ISK, or at least that's the conclusion of someone who follows the illicit RMT trade. Processing that much ISK put the entire business at risk. Next is the point to which the price rose. I'm pretty sure that the $65 / 1 billion ISK was near the official rate obtainable by purchasing the newly introduced PLEX. And the final conclusion I can find is that reading the articles at MMOBUX can give me a head's up on what Team Security is up to. The article on MMOBUX was published on 10 July 2009 while the official dev blog announcing Unholy Rage came out on 17 August. I'm aware that Unholy Rage occurred before CCP Sreegs was hired but the War on Bots™ is a conflict taking place in the shadows so finding any regular sources of information is always a good thing. CCP Stillman made a bold statement at Eve Vegas about ending the social acceptance of illicit RMT and CCP Sreegs doubled down on going after the two handfuls of alliances whose leadership is engaged in the trade. We've seen what happened in 2009 to the price of illicit ISK. I'm looking forward to observing what occurs in 2013.